Step back in time to visit the former home turned museum of President Harry S. Truman, located on Front Street in Key West. Known as the winter White House, take a guided tour through Truman's personal artifacts and see where he lived, worked, played, and held important government meetings. Stroll through the lush manicured gardens, ideal for any outdoor Key West event. As Florida's only presidential museum, Truman Little White House was also used by Presidents Eisenhower, Kennedy, and Carter making this building a significant part of American History. Visit the gift shop for collectibles, keepsakes, books, and mementos, perfect for any history buff. Check out our convenient accommodations at Southwinds Motel, steps from TLWH. Open daily from 9 am to 4:30 pm. The gift shop stays open until 5 pm. Can I have a wedding at Truman Little White House? 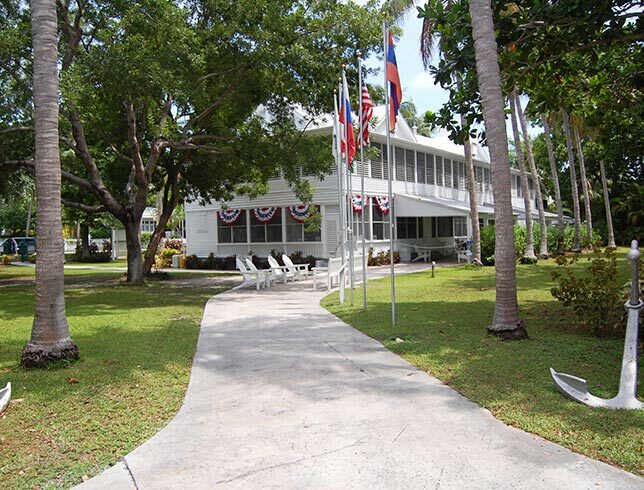 Yes, the Truman Little White House offers a perfect venue for weddings in Key West. With three event spaces and multiple gardens, plan a romantic affair under the stars. Each lawn can be used together or individually and can accommodate up to 100 guests. They offer catering and wedding planning services as well. Contact us for group room rates for your wedding at Southwinds Motel, just steps from the Truman House. When are the Truman Little White House tours? House tours are offered approximately every 20 minutes from 9 am until 4:30 pm daily. You can buy tickets in advance (cheaper) or in person at the time of tour. Tours of the botanical gardens are self -guided and free, and run until 6 pm.